When you think of old, classic yet popular games Poker and Chess will usually be among the top games listed...but they have never been combined into one game - until now. Boasting centillion-quintrigintillion possibilities, every game will be different and impossible for even a computer to beat you. PokerChess combines the loved feel of both Chess and Poker with this brilliant and simple game. Play times are not as long as traditional chess and hand betting is involved just like Poker with real chips even. Learn all there is to know about PokerChess and get your copy today! Review Completed (2017-12-26) When we first heard of the game PokerChess we assumed it would be a combination of Poker and Chess but didn’t understand how they would pull it off. Well, they pulled it off alright and what a wonderful job they did! If you have played either game, you’ll have half the game down, making the other half not difficult at all to understand. Don’t worry to all those non-poker players out there. The Chess portion of the game is not as complicated as the real game but still adds a very strategic twist to the game. Most people think of uniquely crafted high quality Chess boards with Chess and a casino type felt and chips feel with Poker. PokerChess nailed it when they created the game pieces for this game. 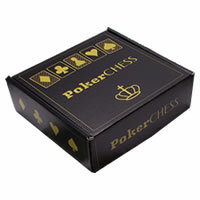 Built in a sturdy, simplistically designed box with a magnetic flap (we loved this part), PokerChess doesn’t disappoint when it comes to quality of components. 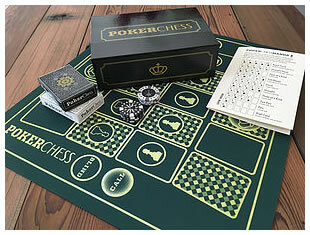 A large felt/rubber mat is the game board, real poker chips come in a padded felt drawstring bag along with two high quality decks of customized cards. Our only concern is the game box seems slighty too small for how you have to fold the game mat in and we’re concerned the mat will crack or have permanent damage after long storage periods. Only time will tell on this one. Overall, very well done. The rules are well written and surprisingly short for the possibilities and strategy in this game. Once you get through your first game, you mind almost gets blown by how many different ways this game could go. 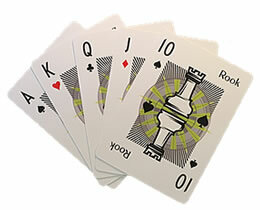 A cheat sheet for Poker hands as well as Chess moves are included in the game rules. With three different ways to win (raise / fold, checkmate / showdown, crown victory) you’ll want to understand each one so you can choose the best way to win. We really enjoyed playing this game. Surprisingly, not many of our test players were big fans of either game but they caught on quick and had a good time playing. They all had a light bulb moment near the end when the game rules clicked and they wanted to play again. While only good for two players, PokerChess is a great game to challenge someone else to and it won’t take all night to play. There are three different ways to win - please refer to the game rules and instructions for more details. You get a high quality gaming mat, 10 casino quality poker chips, 2 decks of custom pokerchess playing cards and the official PokerChess game rules and instructions. Please keep in mind that the official PokerChess board game rules and instructions could be different depending on the game version you have. The rules below are some of the exact directions on how to play PokerChess. Share with us your comments, funny stories, tips, advice, strategies, creative ways to play, questions about how to play, problems with the rules or anything you want about PokerChess. All submissions will be reviewed within 24 hours. Click here to add your PokerChess comments. Poker Chess sounds like a really great game. I'm a fan of both so seeing them together sounds great.